“Haitians are frustrated because they can recognize a fraudulent election when they see one, and they think that the international community will give their blessing to this election,” said Nicole Phillips, a lawyer for the Institute for Justice and Democracy in Haiti (IJDH) and law professor at the University of San Francisco. Throughout the day, violence was invited in the elections. After the declaration of the 12 candidates calling for the cancellation of elections, voters across the country have ceased to vote for the most part, and begin to organize peaceful demonstrations sometimes but more often violent. A real tussle ensued between the Government and population, which considers that the fraud and irregularities, were designed to steal their votes. On Monday, the country has become a tinderbox, the authorities decisions in the coming days, faced with these fraudulent elections, could easily serve as a detonator in a population which in these elections, found reason to rally against the government. The situation is very unstable and it is not reassurances from authorities that will change the situation. Near the airport, an important polling station (25 BV – more than 10,000 registered voters) was completely ransacked in the Sunday morning by a commando of about thirty persons unidentified. Destroyed ballot boxes, hundreds ballot checked by voters scattered by the wind… At 1:00 in the afternoon, only the supervisor was on site, the CV (Pooling station) was closed. After the decision of 12 presidential candidates to seek annulment of the elections, thousands of demonstrators headed by the presidential candidates including Michel Martelly (repons Peyzan), Charles Henri Baker (Respè) and Wyclef Jean have demonstrated against frauds that have skewed the voting. Other groups of demonstrators from Port-au-Prince have joined the protesters in Petion Ville and went to the local of Provisional Electoral Council (CEP) in Delmas in chanting slogans hostile to the Head of State. Peacekeepers from the UN and Haitian police (PNH) were called in front of the headquarters of the CEP. Protesters threw stones at police national who responded by firing into the air. The polling station located at lycée de Diquini was closed by a population furious of the lack of organization. Electoral registers and ballots were torn and thrown into the street by electors furious that their names were not on the electoral lists from the polling station of the Ecole Nationale. In the late afternoon thousands of people took part in a demonstration against the government. Hundreds of “supporters” of Mirlande Manigat attacked (after the declaration of annulment of the elections) polling stations, and destroyed all equipment under the eyes of helpless Minustah peacekeepers. At lycée Célie Lamour, the polling station was ransacked by angry individuals who put the employees at the door. A police-court magistrate made a statement before the polling station closes. 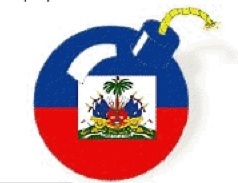 In La Vallée (Jacmel), protesters erected barricades of burning tires and threw stones and bottles. The police brought in reinforcements to cope with the situation. Several injuries were reported among the demonstrators and the police. The two polling stations of the town were ransacked by people who drove electoral officials and prevented the vote. A “peaceful” demonstration of supporters of Michel Martelly and of Jean Henry Céant, protesting against irregularities and demanded the cancellation of elections. Many demonstrations of angry voters have been reported. In Desdunes, clashes between rival parties have caused the temporary closure of a polling station. A shooting death and several injuries were reported. Madan Maniga ak Michel Martelly pral peye sa che.